V-MODA, maker of the world’s finest high-fidelity headphones trusted by pros and savvy consumers alike, is proud to spearhead the new industrial revolution with the world’s first 3D printed personalized wearable technology. What seemed impossible is now a reality with V-MODA’s new platform. Inspired and sculpted in V-MODA’s design studio in Milano, the 3D shields are Made in NYC and the USA. Customers will be able to customize their headphones on the V-MODA website by first selecting the base color; users can then select their 3D shield material of choice and then choose their design and monogram or upload their own design (Beta). 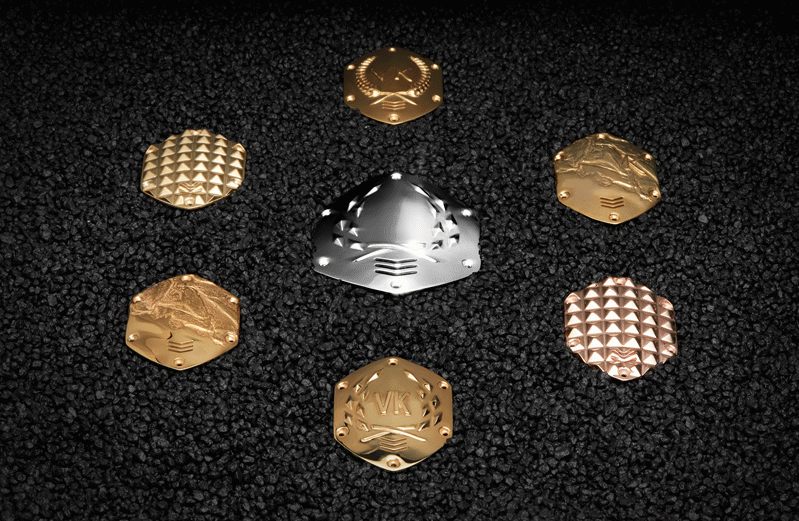 Precious Metals: Precious metal shields are commissioned works of art and the ultimate symbol of bespoke luxury. Available in sterling silver, solid 14k gold, 14k rose gold, 14k white gold or platinum to reflect your personal style. Sterling Silver: $430 for on-ear, $650 for over-ear shield kits; $620 with XS, $900 with Crossfade M-100. 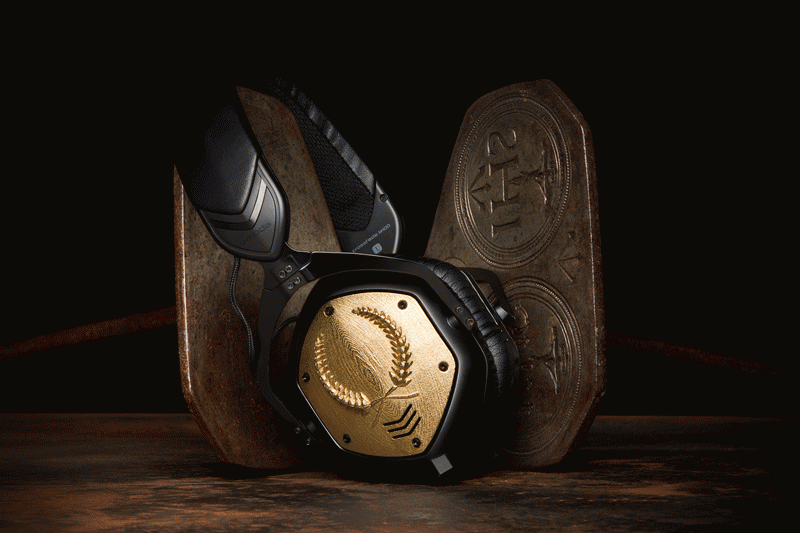 All precious metal offerings include a lifetime warranty on the headphones and the option to upload your own design for 3D sculpting by V-MODA’s Italian designers. Raw, Rhodium and Gold-Plated Metals - Luxury within reach. Personalized shields offer sophisticated designs at an accessible price point. Available in raw brass and raw bronze that patina over time as well as brilliant rhodium plated, 14k gold plated and 14k rose gold plated. Price: $180-$330 for on-ear, $350-$550 for over-ear shield kits; $370-$520 with XS, $600-$800 with Crossfade M-100. Upload your design (Beta) is included. Stainless Steel – Steel shields feature a distinctive “Damascus steel” effect that allows you to proudly showcase the advanced 3D technology. Available in matte black, stainless steel, polished gold, polished bronze and matte bronze. Price: $100 for on-ear, $150 for over-ear shield kits, $270 with XS, $400 with Crossfade M-100. Upload your design (Beta) is included. Fiber - Available in nine matte and vibrant colors, 3D printed fiber is lightweight and features a matte touch. Price: $40 for on-ear, $50 for over-ear shield kits (add $20 for upload your design); $200 with XS, $270 with Crossfade M-100. V-MODA’s collection of designs were inspired by Milan’s tradition of Renaissance art, meticulous attention to detail and trendsetting attitude. Monogram - The epitome of timeless, classic and elegant personalization inspired by the monograms on tailor-made shirts adorned by professionals in the Quadrilatero della Moda (‘quadrilateral of fashion’). Victory and Vectory (Monogram) - A symbol of triumph and success, wreaths made of laurel or olive leaves were used by Romans as a crown of victory. The symbol is perfect for celebrating any achievement in your life. These designs also pay tribute to the triumphs of the Crossfade M-100 and XS which have won 21+ editors’ choice awards. Sculpture (Monogram) - This design pays homage to renaissance sculptors and Michelangelo, whose last sculpture is outside of the V-MODA Milano studio. The design also features the shoreline of iconic Ibiza, the music mecca for multitudes of EDM fans and where the idea for V-MODA was born. Available initially as a Beta feature, upload your own design in 2D of 3D for embossing by the V-MODA Milano’s 3D sculptors. The logo will be embossed at a height of 1mm and the design should have lines with a minimal thickness of around .8-1mm at the sharpest point to ensure the best results on the 3D headphones. Whether you are a DJ looking to endorse yourself, a maker exploring the future, a gamer flashing your badge or want to stand out from the sea of plastic headphones, V-MODA’s 3D headphones are now available in infinite options at every price point. The 3D printed shields are the latest addition to the venerable V-MODA accessory ecosystem that make the Crossfade and XS series the ultimate headphones for home, on-the-go and on stage. The 3D printed shields are compatible with the hundreds of thousands of V-MODA Crossfade series and XS headphones already in use. They join the accessory collection of BoomPro mic for gamers/broadcasters, XL cushions, CoilPro cable, 1/3-button cables, Vamp DAC/AMP and laser engraved aluminum shields. V-MODA is ushering in the next industrial revolution of A.M. (additive manufacturing) to the people and is therefore reducing the everyday price on Crossfade M-100, XS and Crossfade LP2 to allow people to upgrade to 3D printed shields and spread the word. The fiber 3D shields are included in the purchase of a new XS and Crossfade M-100 at the new lower price of $200 and $270, respectively. Retailers will sell the Crossfade M-100 at $249.99, Crossfade LP2 at $149.99 and XS at $179.99 to allow users to upgrade their shields and purchase accessories such as BoomPro Mic or XL cushions. Additionally, upload your own design (in Beta) is at no extra charge with purchase of a headphone or metal shields from V-MODA.com. For more details and pricing of the 3D headphones visit the new personalization site at V-MODA.com/Crossfade-M-100 or V-MODA.com/XS.